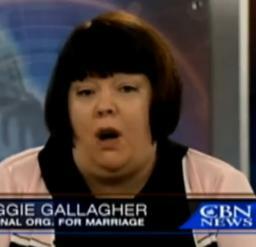 The National Organization for Marriage’s spokesperson Maggie Gallagher continues to offend as she justifies her bigoted political beliefs. Shortly after news that President Obama has ordered the Department of Justice to consider the Defense of Marriage Act unconstitutional, Gallagher called in to FOX News to denounce the act that moves our nation a whole lot closer to equality. “We’re going to be seeing a lot more of this by President Obama now that he faces a republican dominated Congress. He not only is refusing to defend the law, he has unilaterally declared that gay is like black.” Ummm WTF? Nothing like putting your racism up on display next to your homophobia for all the world to see. To be honest, while we find her delivery appalling, we actually agree with the sentiment behind it. Yes, homosexuality is absolutely akin to other attributes like race and gender. You don’t really have a say in the matter. It’s who you are. And that’s what makes beliefs like Gallagher’s sting. She uses her oft-cited Judeo-Christian religious beliefs to counsel lawmakers based on what LGBT people inherently are. Had Gallagher been born in another country or in another time period she would have been raised with a completely different set of religious beliefs, but if we apply the same somewhere/sometime lens to ourselves, we would still be homosexuals. This is who we are. Why is she so threatened as to devote her life’s work to preventing us from being treated fairly? Are any of you surprised though to hear Gallagher speak this way?